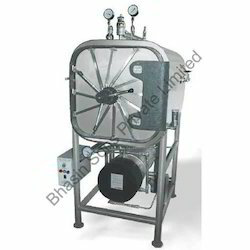 Our organization is engaged in manufacturing and supplying a wide range of Instrument Sterilizers. We manufacture these series of products in acquiescence with the international quality standards and compliances. These products are impeccably reliable and dimensionally accurate. It is widely use for sterilizing wide range of medical instruments. It is capable of withstanding high level temperature, increased while the process of instrument sterilization. 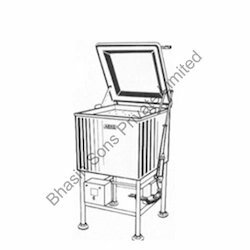 We are experts in manufacturing and exporting a wide range of High Pressure Rectangular Steam Sterilizer around the globe. These are compactly designed with Triple walled construction and self-locking safety doors for effective functioning. More over the Outer Jacket is insulated to prevent heat loss and with ground leveling flanges. It is manufacture using industry leading steels and corrosion resistant materials to ensure its durability. Complete sterilizing cycle is controlled by means of "Multiport Valve"
Outer Jacket insulated to prevent heat loss. Mounted on tubular Mild Steel frame with ground leveling flanges. 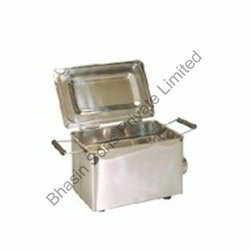 With wide and rich industrial experience, we are able to offer Bowl Sterilizer Electric. We use advanced machineries for the process of manufacturing our entire products. Our products are made of various metals sourced from trust worthy vendors. 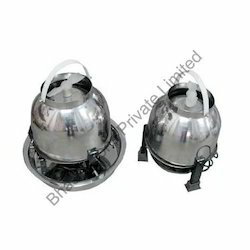 These products provide features, such as full electric functioning, bowl like design, electric motor at the base and portable size. In hospitals this are widely used for sterling needles and operation knives and scissors. High Pressure Horizontal Cylindrical Steam Sterilizer is one of the first-rate products that have a wider acceptance in the market. The special features of these products are Pressure controller, spring loaded safety valve, temperature controller, plug screen and vacuum breaker. Our range is manufactured using high grade raw materials that are in adherence with the global standards. This product requires power supply of 440v sufficiently. We hold the expertise in manufacturing, wholesaling and exporting Aerosol Disinfector around the globe. Our products are manufactured using superior grade materials purchased from trust-worthy vendors. All our products are made with modern methodology. The entire products of us are featured with rigid body, light weight body and high temperature enhancer. This is widely used in disinfecting needles, operation accessories. Output : 1.5 to 5 Lts/hr. Backed by the perfect state-of-art infrastructure, we manufacture and export an ample range of Fumigator Aerosol Disinfector. These products are manufactured using best quality raw materials to ensure its reliability. Aerosol disinfectants are widely applicable in hospitals, research laboratories and pharmaceutical manufacturing companies. 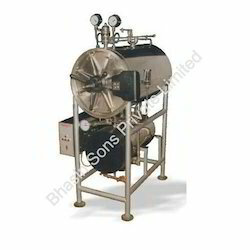 It is designed with extreme efficiency to convert liquid formalin to pure aerosol at the instant. These fumigators are capable of providing 100% sterile and germ free Environment, with reduced power consumption. Backed by the sound state- of- art infrastructure, we offer Formalin Chamber across the globe. 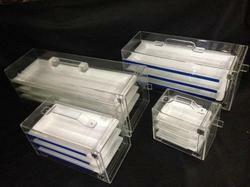 These are manufactured using excellent quality glass and other components. The modern design ensures the 100% sterilization of the surgical instruments. In addition the three sliding trays meant for comfort usage. 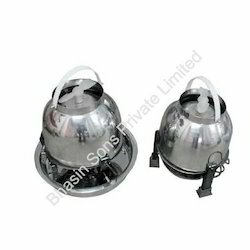 These chambers are available various sizes with different specifications. It is easy to clean and arrange with minimum amount of time period. 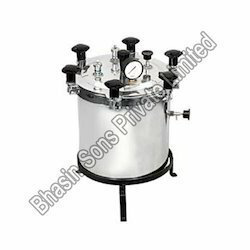 Bhasin Sons Private is one of the leading names in the field of manufacturing and exporting Autoclave Wing Nut Type around the globe. We manufacture all our products with best aluminum materials sourced from top most sellers. These are featured with analog pressure and temperature display, black plastic coated nut and wide stand base. Our products are preferred in all hospitals and laboratories for autoclave functions.